Yahoo rolled into the Carol Bartz era about two weeks ago. Today, the company closed the books on Jerry Yang’s brief executive stint with the release of Q4 earnings. Buried under nearly $603m in one time charges, Yahoo came in with a loss of $303.4m. $108m in restructuring costs. $488m in Goodwill Impairment from overseas. $7m on the quarter in lingering expenses from defraying Microsoft’s takeover overtures. It wasn’t the news that was expected, but looking past the one time elements, it wasn’t all bad either. Revenues less Traffic Acquisition Costs for Q4 were $1.37b, in line with Wall Street expectations. 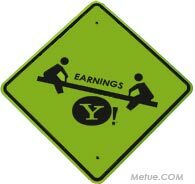 Less the one-time charges, Yahoo profits would have come in at $184m or 17 cents a share, ahead of analyst expectations in the range of 12 to 13 cents. Cash and marketable securities were also up to $3.52b from $2.36b a year ago. A few of the areas to watch: search and international revenue. At just 11% growth year over year, worldwide owned and operated search revenue was in below expectations. The good news, however, the US segment was up 18%. “US queries were up more than 10% and RPS grew in the mid-single digits. International search revenue was down, but closer to flat, on a constant currency basis.” Jorgenson added during the call. Looking forward, Yahoo is forecasting Q1 sales of $1.53b to $1.73b. • Q4 Revenues were $1.806 billion, down 1% from $1,832 million year over year (Y/Y). • Fiscal 2008 revenues were $7.209 billion, up 3% from $6.969 billion for 2007.
million for the same period of 2007.
quarter, up 3% from$1,035 million for the same period in 2007. •For the full fiscal year, Owned and Operated sites generated $4.046 billion for 2008, up 10% from $3.670 billion in 2007. •At Owned and Operated sites, search revenue in Q4 was $436m, up 11% (up 18% US). Display advertising revenue was $506m, down 2%. • Affiliate sites generated $531 million in revenue for Q4, down 4 percent from $555 million for the same period in 2007. • For the full fiscal year, marketing services revenues from Affiliate sites was $2.270 billion for 2008, down 6% from $2.418 billion in 2007. • Fees revenues were $212 million for Q4, down 12% from $242 million for the same period of 2007. • For the full fiscal year, fees revenues were $892 million, up 1% year over year. • Revenues excluding traffic acquisition costs (“TAC”) were $1,375 million for the fourth quarter of 2008, a 2 percent decrease compared to $1,403 million for the same period of 2007. • For the full fiscal year, 2008 revenues excluding Traffic Acquisition Costs (“TAC”) were $5.399 billion for 2008, up 6% Y/Y. • Operating loss for Q4 was $278 million versus operating income of $191million for the same period of 2007. • Adjusted operating income (non-GAAP) before depreciation, amortization, and stock-based compensation expense for Q4 was $542 million. That excludes restructuring charges of $108 million,a goodwill impairment charge of $488 million related to the international segment; and $7 million in costs from outside advisers related to Microsoft’s acquisition effort. •Operating income for 2008 was $13 million versus $695 million for 2007. • For the full fiscal year, adjusted operating income before depreciation, amortization, and stock-based compensation expense was $1.915 billion. That excludes restructuring charges of $137 million; the goodwill impairment charge of $488 million related to our international segment; and incremental costs from advisers of $79 million related to the Microsoft acquisition offer and review of alternatives. income of $206 million or $0.15 per share a year ago. compared to non-GAAP net income of $184 million or $0.13 per diluted share for the same period of 2007. • Net income for fiscal 2008 was $424 million or $0.29 per diluted share compared to $660 million or $0.47 per share for 2007. • Non-GAAP net income for 2008 was $642 million or $0.46 per diluted share compared to non-GAAP net income of $652 million or $0.46 per diluted share for 2007. • Cash flow from operating activities for Q4 was $321 million, down 48% from $622 million for the same period of 2007. • Free cash flow for Q4 was $219 million, down 34% compared to $330 million for the same period of 2007. •Cash flow from operating activities for 2008 was $1.880 billion, down 2 percent from $1.919 billion for 2007. • United States revenues in Q4 were $1.338 billion, up 2% from $1.313 billion Y/Y. • International revenues in Q4 were $468 million, down 10% from $519 million for the same period of 2007. • United States revenues for fiscal 2008 were $5.190 billion, up 10% from $4,727 million for 2007. • International segment revenues for fiscal 2008 were $2.019 billion, down 10% from $2.242 billion for 2007. •Rumor Mill: Jon Miller Raising a Yahoo Buyout Fund? •Icahn Candidates Join the Yahoo Board.